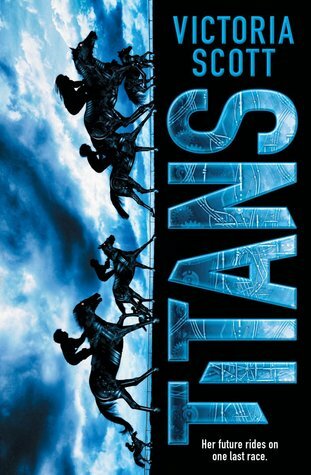 Titans and it’s mechanical horses raced into my heart. I absolutely loved the book. Victoria Scott’s writing is flawless as always and I of course always adore her characters. This book is not just about the races but also about relationships. I’m not talking about the romantic kind but the kind that make people family whether they are blood related or not. Victoria has a way with characters. I loved that they never seem to fit into a specific mold and can manage to surprise me and endear me. Astrid is a strong girl and even though her father doesn’t want anyone to support his family besides him, she carries a lot of the burden of taking care of them in her small ways. She feels like she needs to hold things together and I think sometimes her family lets her not even realizing what they are doing. I loved her personality and how she is described perfectly as being both stubborn and having a big heart. Magnolia is Astrid’s best friend and it’s such a great bond between the two of them. They are true friends that are always there for the other. It became a comfort thing for me to have Magnolia by Astrid’s side because she is just supposed to be there. You can have a great partnership without it having to be romantic. I had a strange soft spot for Astrid’s mom. I thought she was hysterical going around to other people's yards in the middle of the night to take care of their plants. I know it’s a coping mechanism for her but I still keep laughing at Rags comment about her one night. I feel like all the people in the neighborhood should be paying her or giving her vegetables or something. So many characters to go on and on about. Rags and Barney, which not only are a couple of awesome guys once you get to know them. They also have a great friendship. Lottie is just fun and well I guess technically there is romance in the book, just not with the MC. The Titan Jockeys, the frenemies, the enemies and of course Astrid’s family. Her sisters and her dad and the complicated relationships they all share while dealing with hard times. Of course as we learned from the Fire & Flood series (if you haven’t read it you should), Victoria Scott has a way of writing thrilling race competitions. I loved reading about the challenges of each track and the way Astrid uses her head to strategize through them. I also really love that Astrid is not great right out of the gate. She might be a natural but she’s not a prodigy and we see her really develop her skill though the story. I loved that. So Padlock. Where do I get my own Padlock. I loved everything about him. I loved Titans. The plot is fast paced and different. It has such great characters and a surprisingly large number of adults for YA. I enjoyed everything about the story and of course I want a Titan. I definitely want to give this one a try! Great review!